Zattoo turns off BBC streams, could TVCatchup be forced to do the same? 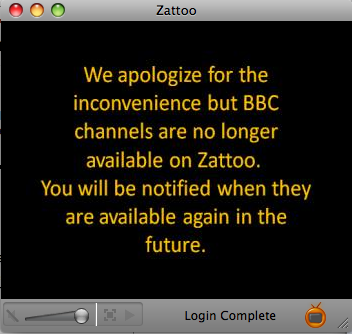 Following a request from the public broadcaster, Internet TV app Zattoo has stopped carrying the BBC’s content. Although only available to viewers in the UK, Zattoo was able to live stream all of the BBC channels because, it argued, of what is effectively a legal loophole. Because each channel carries a public service remit, under section 73 of the UK Copyright Act, cable operators can re-transmit broadcasts live and uninterrupted without first seeking permission. Zattoo is effectively piggybacking the existing cable television provision. Interestingly, along with pressure from the Beeb, Zattoo tells paidContent that it also paves the way for the service to launch a browser-based version alongside its existing desktop client. So in that sense, it may be partly a commercial decision, as presumably Zattoo doesn’t feel its legal defense holds enough water when competing with the BBC’s own browser-based iPlayer. If that’s the case, could this also spell trouble for TVCathchup, which does precisely that. The company streams much of the UK free-to-air lineup of channels and it’s not clear which, if any, are formal licensing agreements. It’s reported that Channel4 and Five are also unhappy with Zattoo carrying their content.